← Disqus Comments Works for Windows to Russia! Goulash is really a Hungarian dish in origin, it most times resembles a thick soup or stew. 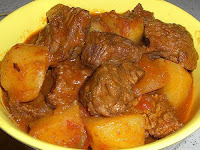 It usually is prepared with beef and there are countless different recipes. This is a very simple, easy and oh – so yummy recipe. Cut the beef into cubes 1 inch on each side – wet beef cube with water and roll in flour. Cut the onions into rings – wet with water and roll in flour. Drop floured beef cubes into hot oil in a non stick skillet. Turn the pieces, so that every side of the cube is flash fried. (This is only to seal the crust not cook the meat.) Once fried put the cubes into a big saucepan. Drop floured onion rings into hot oil in same skillet then once fried like you fried the meat, add to the saucepan on top of the meat. Then add potatoes and tomatoes on top the onions. Salt and pepper to taste. Laurel leaf thrown in pot on top of everything. Add water just to cover the bottom because the tomatoes will produce the liquid necessary. The flour on the meat and onions most likely will disappear as slow cooking develops. It is there to thicken the sauce more than anything. Cooking time usually does not exceed 60 minutes. Just make sure meat is done. There are millions of variations of this recipe and this is not a original Russian food. But Russians love this dish and all have their own version… Lets Eat – Yummy!